This novel owes much more to the cover artists, and supporting artists, than most books do. This is not a case of writing a novel, then looking for a cover artists: Mayan Calendar Girls feature artwork throughout the serial, and we were extremely influenced in our writing, even plot direction, but existing art from some tremendous artists. We were astsonished to discover so much artwork available on Mayan calendar girls, and the variety and quality of it. Apparently the whole concept of beautiful women in a milieu of stone cities and flamboyant jungles is a compelling archetype that we were far from the first ones to stumble on to. 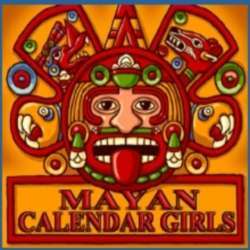 Please look through our collection of artwork and videos: it's really an integral part of Mayan Calendar Girls. We thought it was remarkable when we ran across this piece on Deviantart--proof that Mayan Calendar Girls is a concept that springs forth independently in all great minds. 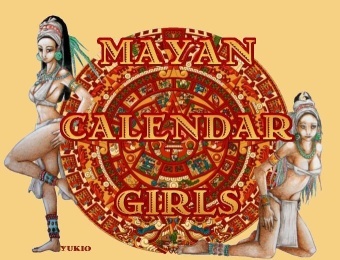 We're delighted to have this as the cover for Mayan Calendar Girls' book and ebooks. Robin's cover art is exactly the sort of influence we mention: the combination of ancient stonework with the perky, innocent glamor of calendar art is very much what the style of the novel is all about. More excellent work by "rccrandall" in the DeviantArt galleries. "Yukio" is from Mexico City, but has lived in the Baja and currently does his artwork on Isla Mujeres, jewel of the Maya Coast. See his Hi5 gallery, Let the monster rise. 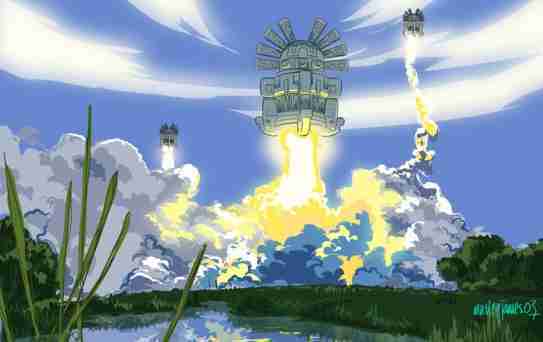 Mutley is another mind that was already running in this channel, as you can see by these Mayan spacecraft--a brilliant visualization of a sort of modern myth/meme. Mutley is very eclectic, as can be seen at his gallery on DeviantArt gallery. A computer artist of unlimited skill and virtuosity, McRaven fortunately paints almost exclusively beautiful women. Including this classic Mayan Princess, ala La Vegas. See more of his beautiful work at Dale McRaven. ARTISTS: Please note that we have received a lot of images from fans and it's impossible to verity it they are the owner. If you see uncredited or falsely credited work here, please let us know so we can straighten it out. A loose group of fun-loving, overpaid, talented, bored young writers, mostly in the television industry. We created MAYAN CALENDAR GIRLS as a diversion and diversionary sideline for kicks. The series was conceived while we manfully fought sunburn, hangovers and jock itch in a condo we share in the Yucatan and owe huge debts of insincere anonymous gratitude to the local writers colony with their support, workshops, BS sessions and endless bickering. Most of the TV guys are anonymous because they're not allowed to write for publication outside their contracts. Or so they claim. But some of the other writers are coming out of the cold. LINTON ROBINSON was outed by the publisher of the paperback. There's little deniability when your name's on the amazon page. GRAYSON MORAN also appears on that page, to his chagrin, apparently a sneak prank by Lin. He'd care about that if he wasn't buried in the bush in Belize and up to no good. CAMMY MAY HUNNICUTT is a surprise "outee", since she refused to be identified pretty vehemently. But now she's been corrupted and trying to get her own books out there, so she's letting on and fessin' up. Cammy shone as our "hot babe consultant". We have no idea what calendar class girls act like, so she told us. JAMIE WOODSON has also come out of the closet. Like nobody could have guessed that one. He was behind all the political stand-up. More incrimination as events warrant.